2014 was the year I absolutely did not see coming. Instead, I got a call from Wes Schneider, asking if I would be interested in a developer job at Paizo. I WAS interested, of course, and that led to interviews, garage sales, ending campaigns, saying goodbyes, moving cross-country, saying hellos, and trying to settle into a brand new job while (trying to) maintain everything I was already doing. That’s what I get for expecting things. Of course something had to give. The RGG release schedule has not been as consistent as I would have liked, and I’ve been a much rockier freelancer than normal, but the demands of the Green Ronin and Paizo salaried jobs must come first. I said some apologies, turned down a LOT of cool new products, and discovered how much I love the AFK Eatery & Elixirs, and it’s staff and owners. And about a week ago, I got a new cat. I am, I confess, fearful of change. I often do not adapt to new situations well, and dislike not knowing exactly how to meet my duties and other’s reasonable expectations. This year has been amazingly stressful, but it’s also included my first Comicpalooa, my first PaizoCon, my first Green Ronin summit, and my first time as a judge (and indeed host!) for RPG Superstar. I miss my lifelong friends from home, but I also embrace my new friends, and the opportunity to spend more time with Seattle folks I got to know back in 200-2001. So, here comes 2015 and I expect… nothing. Very carefully, I am making very few promises to myself. This has been a BIG life change, and if I need more time to digest it then, in between the work of three game companies, a wife, a cat, freelance, and new friends, I’ll give it to myself. Of course things aren’t all sun and roses – moving is expensive, Seattle is expensive, and disruptions to my schedule cost me money in lost opportunities. But this move DOES put me in a VERY different place as far as opportunities to GET better go, and I look forward to seeing how those pan out. I love you all, and I hope everyone has an awesome (and safe!) New Year’s Eve! At the very edge of the Imperium, a human has been born with the power to fuel her own Astronomican. At an early age she was found and protected by a group of Eldar who believe her to be Ynnead, the new Eldar God of the Dead who was thought to be unable to come into existence until every last Eldar died eons from now. As she matured, “Ynnead” developed the innate ability to nullify psyker powers, an amazing raw talent that demanded training the Eldar could not provide. To aid her they found Senseis–descendants of the Emperor of Mankind who are psychic nulls–and trusted them with the secret of her existence. The Sensei trained “Ynnead,” and word of her existence reached the Thorian faction of the Imperial Inquisition, who came to believe she was the Star Child, the Emperor of Mankind reborn, and that her birth is proof that despite still functioning on a psychic level the mummified remains of the Emperor within the Golden Throne had, in fact, died. The Thorians named her Malcadora, and decided her existence meant all the rest of the Imperium has fallen into heresy. The Thorian Inquisitors moved to claim as many Imperial resources as possible to support Malcadora/Ynnead, convincing a few Imperial Legions, Sisters of Battle, Deathwatch Space Marines, and members of the Ecclesiarchy to join their cause. A New Imperium is planned, but is nearly destroyed before it can begin by the arrival of a Tyrannid splinter-hive. The Eldar and Thorians supporting Malcadora/Ynnead fight bravely, but are impossibly outnumbered. The Star Child God uses her powers to send out a psychic command for others to aid her… and she is answered by a sept of Tau (who claim supporting her is a crucial part of the Greater Good), and a Necron Dynasty, who acknowledge her as a reborn Necrontyr and an instrument of their revenge on the Old Ones and C’tan. Her command of a dynasty of Necron convince more Eldar that she is their new God of Death, and her support among them grows. The brunt of the splinter-hive attack is defeated, narrowly, but Tyrannid and gene-stealers continute to be a threat to the rising organization serving Malcadora/Ynnead. As the campaign begins, the so-called New Imperium is a tiny, fragile thing with barely a handful of worlds and smattering of massive Craft Ships, a single Necron Dynasty, a rag-tag Imperium presence, and a fleet of Tau allies to support it. On her Adamant Throne, built to aid in her slowly growing Astronomican, Malcadora/Ynnead strives to save all the souls she can, fend off armies of the Tyrannids and a growing Chaos interest in her and her allies, all while contending with advisers and allies who have fought one another for tens of thousands of years. She demands respect, but she demands it not just for herself, but for all life. If the New Imperium is to survive, it must have agents. Drawn from many races and traditions, from Imperial forces to Rogue Traders to Necron Lords to Eldar, these agents must work together to find new allies, gather more resources, fend off the forces of the Tyrannids and Chaos, and prevent the still-hateful-and-fearful majority of the old empires of Man, Eldar, and Necron from slaying Malcadora/Ynnead as a heretic and potential new Chaos God. These combinations have already allowed the creation of new technologies long thought lost or impossible — female space marines, psyker therapy, and Chaos shielding to name just a few. You are one such agent. And you will work with creatures from many different races and backgrounds because Malcadora/Ynnead demands it. And because she may be able to save life and freedom within the Galaxy. For in the grim darkness of the far future, now there is hope. Sauron is fallen these 105 years past. The elves and wizards are gone, though a few of the part-elven born to mortal women just after the War of the Rings remain. Men rule in most lands, thought dwarves slowly reclaim their lost citadels, and a new generation of Hobbits seem increasingly willing to leave the Shire. But a new darkness spreads through the land. A Dark Tree is mentioned, and found as a hidden mark in foul places. Men play at being orcs, and a few agents of shadow remain. Gondor is ruled by Eldarion, son of Aragorn, a good king with strong ties to many folk, from the dwarves and Hobbits to Grimbeorn and the beornlings. Eldarion fears the last rings of power, the three dwarven rings not consumed by dragonfire, are the source of this spreading shadow. It is known they had been recovered by Sauron, and sages claim they were destroyed in the fall of Barad-Dur, and even if not surely their power faded with the loss of the One Ring. But a small group claim that the Dwarven rings absorbed the darkness of gold-lust, and dragon-greed, that they retain the power to bring great wealth, and to spread a shadow through the spirit of all who dwell near them. Warlords of the Apocalypse Cover Art! Believe it or not, we ARE still working on Warlords of the Apocalypse. Obviously being bought out by Super Genius Games, then being hired by Green Ronin, then starting Rogue Genius Games, and THEN being hired by Paizo (without giving up my other game jobs) and moving to Seattle impacted my time to work on this book, but I haven’t given up on it! One thing that has moved forward is new cover art. We can’t use the original art for various reasons, and in general our fans seemed not to be hugely enamored of the replacement art that came with the project. We worked on sketches before, but those stayed with Super Genius when Warlords came with me. 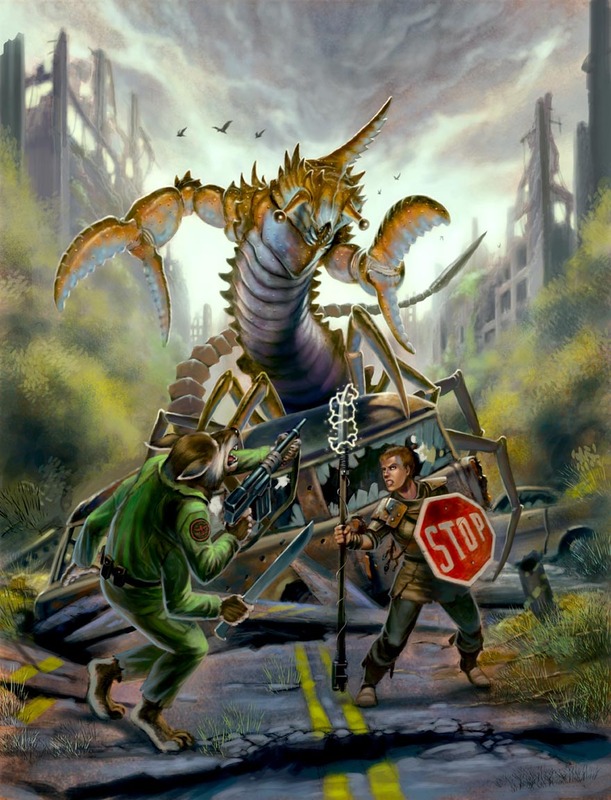 We do now, however, have an awesome piece we commissioned from Eric Lofgren (http://www.ericlofgren.net/), which we are revealing (in low res form) for the first time today!